I feel like I have tried every green smoothie recipe known to man. I love them all. My toddler, not so much. He’ll drink it, but only ever half, and sometimes with bribing. I know, I know. Many of you are aware that I’m a big fan of Baby-Led Weaning. And bribing isn’t a word in their vocabulary. But I just get so excited about the rawness and goodness of these drinks! And in my opinion, what’s not to like, right? I finally thought that maybe I was adding too much. Maybe the flavor palette was overwhelming him. So I simplified, but still left the greens :). He downs it now, and also has no idea that I put his probiotic in there ;). It is now tasty, cheap, and easy. I had the brilliant idea of adding a little frozen juice concentrate (we use this for vitamin C sometimes). It adds great flavor, and though we’re not juice fans at our house, I felt this was such a small amount. This recipe makes enough for all 3 of us. Blend all ingredients in a blender/food processor. Adjust to taste. If you want something more filling for breakfast, add ¼- ½ cup of oatmeal. It thickens it nicely and is a wonderful grain for mamas and babies! This recipe is simple and delicious and one of those 'tweakable' wonders that make you feel like a super chef instead of a tired mama... who most likely has some kind of food item or spit up in her hair. Plus, if you have a picky eater who has developed a fear of all things GREEN, getting a taste of these bad boys just might help give them the boost they need to be lean mean green eating machines! I give you the tasty and crispy, Parmesan Zucchini Chips. To be honest with you I don't remember where the original recipe came from, but I DO remember tweaking a few things here and there so I snagged a basic one off of Food Network as a base to run off of. Instead of blabbing on and on about each step... which wouldn't take that long considering it's an incredibly easy recipe... I figured it would be more entertaining and MOUTH WATERING if I walked you step by step with photos of how it went down in my kitchen. Slice the zucchini into 1/4" thick rounds. The thinner the slice the crispier the chip. I've never been a very meticulous slicer so you should know that even the thicker pieces turned out great, with a soft center and yummy crunchy crust! In a small bowl, combine egg yolk and water as a pre-seasoning bath for your zucc. In a separate bowl, combine your spices, breadcrumbs, and cheese. Dip each slice of zucchini into the egg wash and then coat with cheese mixture on both sides. Lay slices on a foiled and greased baking sheet, making sure they are laying flat. As a side note, I ended up sprinkling and pressing some of the larger pieces of Parmesan onto the tops of the zucchini for added flavor and because cheese is kind of the best thing in the world. TOTALLY up to you. Next BAKE the chips for 25-30 minutes, turning 1/2 way through with a spatula to make sure the bottom sides gets nice and crispy. FINALLY you can enjoy the crispy, cheesy, deliciousness of these bite-sized veggie chips. WOW your kids with your amazing cooking skills and watch their adorable little faces as they realize they actually LIKE this mysterious green food. Then, pat yourself on the back and add this recipe to your stack of go-to options for any night of the week! What did I tell you, simple and delicious! I won't ramble on any longer, but instead let you get right into the recipe! So, in the words of Julia Child... Bon Appetit! We love fried rice, but it is hard to find a recipe that tastes as yummy with healthy ingredients and brown rice. I came across this one in the Better Homes and Gardens magazine, and love it! I never would have thought to add beans to fried rice. It is super simple as well, and we always have leftovers. In a 12-inch nonstick skillet, heat 2 tsp. of the oil over medium heat. Add pineapple; cook about 2 minutes per side until golden brown. Remove from skillet and set aside. (Note: Canned pineapple won’t get the same caramelized look, but it will still taste delicious). Pour the remaining 1 tsp. oil into the hot skillet. Add carrots; cook, stirring frequently, for 5 minutes or until just tender. Add garlic and ginger; cook 30 seconds. Stir in brown rice, garbanzo beans, and peas. Add soy sauce. Cook and stir about 4 minutes or until heated through. Stir in cilantro. Return pineapple to pan. To serve, squeeze lime over all. Top with additional fresh cilantro leaves, if desired. Makes 4 servings. I’m pretty set on owning chickens one day for this reason: there are only 3 of us now, but we all love eggs, and we tear through a carton like nobody’s business. This quiche is one of our favorite things to eat. It’s super filling and makes a great dinner entree! The whole wheat crust is also easy and tasty, and you mix it right in the pan. You can take the time to sauté the veggies to give them beautiful color and flavor, or you can just add them raw. Both will be successful! In a 9-inch pie pan, combine all ingredients and mix with a fork. After mixing well, use your hand to form a ball in the pan and then press into pan. Bring it up on the sides and pinch the top (with your finger or a fork). Then mix and pour quiche filling right into the raw crust. No more dreaded pie crusts! Optional cheese, meats, olives, etc. In a large bowl beat together the eggs, milk, black pepper, chopped basil and salt and set aside. Letting the egg mixture get to room temperature is preferable. Thinly slice the onions and caramelize them in a pan with the oil. While the onions are cooking cut the tomato in half. Slice one half and set aside to place on top of the quiche after it’s assembled. Chop the other half and set aside to add to the egg mixture. Next, slice the green onions into narrow strips and dice the garlic. When the onions are done, fry the garlic in the leftover oil until crispy, then fry the green onion. Add your half a tomato, half the onions, garlic, and half the green onions to the egg mixture. You can also add any other veggies, meats, and cheeses that sound delectable! Pour into the pie crust. Bake at 350 for 15 minutes. You may want to place the pie pan on a baking sheet if it is really full. After 15 minutes, remove from the oven sprinkle the leftover tomato, onion, green onion. Return to the oven and bake until just firm, another 15-25 minutes. Make sure the center is done by jiggling the pan a little. Let the quiche cool for a few minutes to finish setting. Our family went "grain-free" about a year ago, and I stumbled upon this amazing recipe when preparing for my daughter's 2nd Birthday! It is incredible, and you will truly NEVER go back to dry boring cupcakes. Our leadership team at The Motherhood Collective© requests them for every gathering. Blend the beans, 2 eggs, vanilla and sugar in the blender on high until completely blended. In a large bowl, beat the butter/coconut oil until fluffy, then add the remaining two eggs, beating well after each. Add in the bean mixture. Sift in the cocoa powder, baking powder and backing soda. Beat for 1-2 minutes, or until well combined. Pour batter into your prepared muffin pan, filling each about 2/3 full. Bake for 20-25 minutes, or until your cupcakes look like Caroline's beautiful photo below. I chill in freezer until firm and cool before icing. This frosting is seriously my "go-to" frosting for everything currently.... thank you Caroline. Thank you. Beat the peanut butter, butter and powdered sugar until combined. Add in the whipping cream and beat until light and fluffy, being careful not to under-beat or over-beat. Put in a ziplock bag, cut a hole, and decorate the cupcakes OR use a piping bag with your favorite decorating tip and decorate the cupcakes OR use a knife and spread to decorate the cupcakes. Finish with a mini Reese’s Peanut Butter Cup. Looking back to my engagement, I think the recipe exchange was my favorite part of bridal showers. I loved getting to see what each friend brought as a tried-and-true family recipe that should be shared with a new couple starting off. Of course, some were okay, some were just weird, and some became instant favorites. This baked oatmeal quickly filled the latter. Amazing. We will eat it any time of day, and you just might see it on the dessert menu as well. Ingredients: 3 cups oatmeal 2/3-1 cup sucanat (or other sweetener) 2 tsp. baking powder 1 tsp. cinnamon 1 tsp. salt 1 cup milk (I use almond or coconut) ½ cup melted butter (or other oil) 2 eggs, beaten Fruit, optional—I LOVE adding mashed bananas. Peaches also taste heavenly! Combine dry ingredients in a bowl. Pour milk, eggs, and butter in and mix well. Spoon into a greased 9” pan. Bake at 350 for 35-45 minutes. It’s great warm out of the oven. You can add extra fruit, pour milk over it…yum. The last time Anne Hathaway hosted Saturday Night Live they did a hysterical Les Miserables spoof during her opening monologue. In it, the majority of the SNL cast sang about working hard during the week, performing on Saturday night, and making chili on Sunday. Between my own spouts of laughter, I couldn't help but think, "Ain't it the truth?" There's really no better day to have a bowl of chili than on a rainy Sunday afternoon after church. To add to that, if there's one thing every housewife/mom should know how to make it's a great pot of chili. If you don't already have a go-to recipe, have no fear, you're about to get one. I was lucky enough to stumble across a really great healthy chili recipe a few years back on the Lovely Little Details blog. I made it as it was written the first time, and each time shifted things here and there until coming to a final chili resting place. I decided it is delicious and simple enough to share with my fellow mommies. Cook sausage and ground turkey over medium-high heat until brown in a deep pot or Dutch oven. Drain the meat and return to pot. Add onion, bell pepper, garlic, jalapeño, chili powder, brown sugar, cumin, tomato paste, oregano, pepper, and salt. Mix together until fully incorporated. Add remaining ingredients and combine thoroughly. Bring to a boil. Cover and reduce heat to a simmer for 1 hour (at least), stirring occasionally. Discard bay leaves and serve with cheese and sour cream as desired. And of course, it will be extra delicious if served with some yummy cornbread! This is absolutely delicious and like most chili recipes, tastes even better the next day. I'm all about changing things up to meet your personal taste, so if you happen to try this recipe and tweak a few things here and there be sure to leave it in the comments so other moms (including me) can consider your changes. Cream sugar and shortening until smooth. Beat in egg. Stir in dry ingredients alternately with milk. Put in greased muffin pans. Bake at 350 degrees for 20-25 minutes. Mix cinnamon and sugar. Dip muffin in melted butter and roll in cinnamon sugar mixture. This is a FAVORITE in our house. Maybe even once a week...shh...don't tell! The original recipe is from www.paleomg.com. Time to bake that sweet potato. Preheat your oven to 425 degrees, use a fork to puncture holes all around it, then throw in the oven for 25-30 minutes. Once your sweet potato is soft and cooked through, peel off the skin and mash it up in a bowl. And turn your oven down to 350 degrees. Mix well to incorporate all that goodness. So...do you like breakfast? (Of course you do.) Well then, friend, let me introduce you to a recipe that will change your life. I make this when we have family in town or when I host friend-get-togethers or when it's a Tuesday and I want it. Stratas are awesome. You make them ahead of time. They are totally customizable based on what you like. You can throw in whatever extra stuff you have in your frig. Well, as long as you have eggs. You need eggs. And lots of them. 8 cups (a large loaf) French or Italian bread, cubed - Use whatever you have. Dense breads are great! 2 cups of grated cheese - Gruyere is awesome, but I almost never have that in my frig. I always have some sort of cheddar-blend, so I typically use that. 1 cup of finely grated Parmesan - I also like to add feta. Sometimes I adjust the other cheese amounts. Sometimes I just throw caution to the wind and dump lots of extra cheese in the bowl. No one ever complains about extra cheese. 2 3/4 cups milk - skim, whole, buttermilk, a combination, whatever... 9 large eggs 2 tablespoons mustard - I've used yellow or Dijon. Sauté the onion in butter for about 3-5 minutes. Carefully add the fresh spinach and let it cook down. Add 1/2 teaspoon salt, 1/4 teaspoon pepper and nutmeg and continue cooking for another minute. Spread half of the bread cubes in a buttered casserole dish. Add some of the spinach mixture. Add some of the cheese mixture. Continue layering bread, spinach, cheese. Whisk eggs, milk, mustard and remaining 1/2 teaspoon salt and 1/4 teaspoon pepper together in a large bowl and pour evenly over strata. Cover the casserole dish and stick it in your frig overnight (or at least 8 hours). The next day, let it stand at room temperature for 30 minutes while preheating the oven to 350°F. Bake strata, uncovered 45-60 minutes. (Mine always takes 60 minutes.) It will get all puffy and golden brown. Stick a knife in the middle and make sure that the eggs are set and fully cooked. Variations: Add veggies. Chopped zucchini, yellow zucchini, peppers, broccoli, whatever. 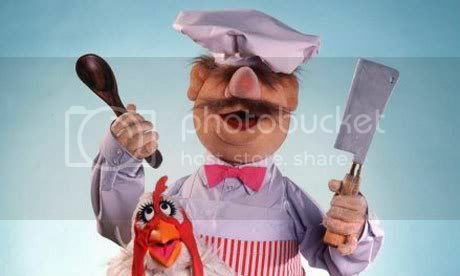 When I add vegetables, I saute them with the onions. Add meat. Sausage is my favorite. Just brown it until it's crumbly and add the sautéd onions. You can do bacon, too. Cook it, crumble it, throw it in there. Have some chopped ham? That'll work, too. Try different breads. There's a local bakery here that makes a spinach and mozzarella bread. It is delicious in this! Also, feel free to clean out your bread drawer. Use whatever combination of breads you have laying around. Thicker cut bread seems to get fluffier, but thin-cut bread still tastes delicious. Sourdough, rye, Wonder Bread - anything will work! Every mama needs an a few simple, easy-to-make recipes that require little to no prep and can be made in under 30 minutes. The best thing about this is that as simple as it is, you can adjust to make it more organic and health conscious if desired. Preheat oven to 425 degrees Fahrenheit . In a large bowl, stir together the flour, Parmesan cheese and salt. Using a pastry blender or two knives, cut in butter until mixture resembles fine crumbs. Stir in cheddar. Sprinkle water over mixture, stirring lightly with a fork. Shape dough into a uniform ball. Cut into as many as twelve equal parts. (I like making larger pretzels by cutting into only six parts.) Roll parts into logs and shape into pretzel or shape desired. Bake 12 minutes. They don't really brown at all so bake the full time. Hope your kids enjoy this treat as much as mine do! We love salads any time of the year, and this recipe is so tasty that we sometimes just make it our dinner entrée for the evening, served alongside a thick slice of French bread. Combine dressing ingredients ½ hour before serving. Directions: Toast the sesame seeds in a dry pan over medium heat. Watch carefully and stir often, as they will go from just right to burnt in a matter of seconds. Combine lettuce, optional chicken, oranges, onions, and toasted sesame seeds. Let chill for 10 minutes. Before serving, add the crunchy rice noodles and dressing. Every since childhood, I've loved my mom's granola recipe. As far as I can remember, she only made it occasionally. The time I remember most vividly was when we spent time at the lake with some family friends. My mom made a giant batch and I ate it all weekend. When I came home from the hospital after my second c-section, we lived in a house with horrible air conditioning and one of the very few things that sounded good those hot summer weeks was my mom's granola. I ate it every morning for breakfast and every night over really good vanilla ice cream and hot fudge. And now I here I am pregnant again and once again one of the few things that sounds good is my mom's granola. We have been making up batches of this and eating it for breakfast, lunch, snacks, etc. My kiddos love it and so do I. Hope you all enjoy! (P.S. It really is amazing over ice cream.) Granola Preheat oven to 250 degrees. Add blended liquids to dry ingredients and mix thoroughly. Spread mixture out on 2 greased cookie sheets and bake 1 hour or until dry and golden. Store in covered containers. My 13 month old daughter has become a bit of a picky eater and has been going through spurts of not wanting to feed herself. What a little weirdo, right? Anyway. She's really active and a little skinny in my opinion (the pediatrician says she's just fine, thankfully) so I've been searching for some new toddler-friendly recipes to use to ensure she's getting enough in that skinny belly. Breakfast is generally the meal she's a pro at, so I decided to find a fun breakfast-esque snack that she could enjoy with just about any meal. I looked on a few 'baby food' websites and blogs and finally, because we all know it's like an online Bible for moms, found a great recipe on PINTEREST! 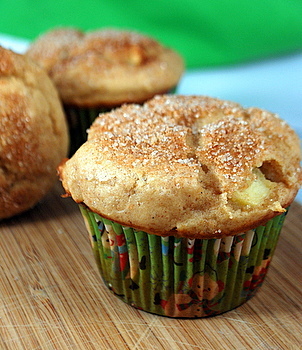 With a name like "mini banana pancake muffins" you really can't go wrong, right? So, I gave them a shot and my daughter went nuts for them. In fact, she totally poo poo'd her scrambled eggs (a normal favorite) and hopped on the pancake muffin train! She loves these little guys, and so do I! They are super easy to make, super easy to tweak (use your kid's favorite fruit), and super easy to store in large batches. Here's the recipe from Once A Month Mom. Now, when I first saw the ingredients and quantities, I was a little shocked that there was so much syrup so I did a little tweaking of my own to start in an attempt to make them less sugary. I basically halved the amount of syrup and added more water. You mix all the ingredients together, fill your greased mini muffin pan, and bake at 350 degrees for 12-14 minutes or until they are golden brown. They turned out great with my small change and after letting them cool slightly I was able to pop them in a large tupperware container and freeze them for an easy go-to snack. They turned out so great (and were such a hit with the little one) that I immediately made another batch using peaches instead of bananas. Still great! In my third attempt I tried switching things up a little more and I knocked down the syrup even more - about 1/8 cup. I used the same amount of water and pancake mix, but added some sugar free applesauce to make up for the missing sweetness from the syrup. Then I used assorted fruit including strawberries, raspberries, mango, and pineapple. The batter looked great but once I took them out of the oven and let them cool a bit they sank in the middle slightly. I think if I added more pancake mix and left them in the oven for a few extra minutes they would have turned out perfectly. Do you have any other great breakfast/snack ideas that are easy to make and modify based on your child's taste? Please share in the comments below, or let us know how these turned out when you made them at home! In a small saucepan, combine the nut butter and the sweetener. Stir over medium-low heat until the two are melted together, about 2-3 minutes. Remove from the heat and gradually stir in the carob/cocoa powder, followed by the sesame seeds, until everything is well combined. Place the mixture in the refrigerator for 10 to 15 minutes to set up. Place the coconut in a small dish. Remove mixture from the fridge, and using a small spoon, scoop up some fudge. Roll it into a 1 inch ball, and roll it in the coconut. Repeat with remaining fudge. Store them in the refrigerator. If you want them to set up more, place them in the freezer. I love soup. I came up with this recipe when I was pregnant and made it all the time! It is full of protein, fiber, and all kinds of deliciousness. Make it as mild or spicy as you want. I like it spicy and because my husband and sons are not spicy fans, I make this huge pot just for me and then eat it for lunch every day for a week! In a large pot, bring 5 cups of water to a boil. (I added onion, garlic, a tsp of salt, and pepper.) Boil chicken breasts, covered, for 20-25 min or until juices run clear. Let chicken rest/cool. Strain chicken broth and set aside. In the same pot, saute chopped onion in 2 tbs olive oil until tender. Add garlic and cook for 1 minute. Add strained chicken broth, Rotel, 2 cups of water, beans, spices (not salt) and rice. Bring to a simmer and cook uncovered for 15-20 minutes or until rice is done. Meanwhile, shred chicken. Add corn and chicken to soup and simmer, covered, for another 5-10 minutes. Taste and season with salt. Like many soups, this one is better the next day. Make it on a Monday and enjoy it for lunch for the next week! I have been a cereal addict for most of my life. There have been many lunches and dinners where I was too lazy to put something together and just enjoyed a bowl of milky, crunchy goodness. My husband and I wanted to get away from all the high-fructose corn syrup cereals, so we switched to more “natural” ones. When Gabriel started wondering why he had to eat sugarless oatmeal while we pulled out the boxed breakfast, I realized I should evaluate our breakfasts a little more. Even though all these cereals had no HFCS, they were still full of sugar, refined grains (aka, more sugar), and pretty pennies. We did a couple weeks without cereal, but got tired of oatmeal and eggs. I had made granola before, for special treats, but they were always either full of sugar, tasteless, or pricey (because of all the delicious nuts and dried fruit). I finally came across this recipe from “Pure Goodness,” and modified it to fit our needs. We love it! And I feel totally fine with giving this to Gabriel for breakfast, soaked in coconut milk happiness, or, when I get around to it, delicious homemade coconut milk yogurt (and before you think that sounds like way too much, I’ll confess that I have a yogurt maker appliance that literally just plugs into the wall. It’s easy, and it works!). I usually double this recipe, and make it every 10 days to 2 weeks. This is the only cereal we have on hand anymore, and we can now have a variety of granola, eggs, and hot oatmeal. It’s very flexible, so play around with it until you like it too! If you want a “special treat” granola that tastes better than ANY store bought cereal I’ve ever had, check out this one: http://ohsheglows.com/2012/10/12/cinnamon-bun-granola-recipe-halloween-treat-a-thon/. While you’re at it, gorge yourself on the entire blog. In a small saucepan cook honey, oil, vanilla and salt over medium heat until the mixture just begins to simmer. Pour honey/oil mixture over oats and coconut flakes, optional cinnamon and flax seed, and stir with a wooden spoon until the well combined. 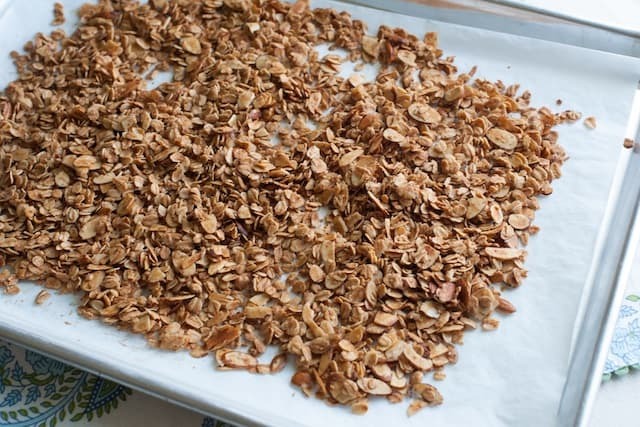 Spread out granola on a parchment paper lined baking sheet. 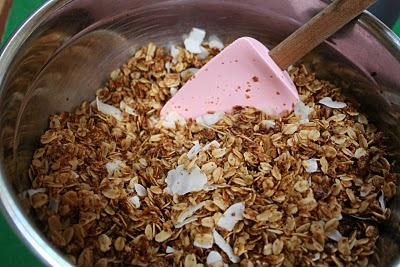 Place in oven, bake for 10-15 minute increments, then stir granola. Repeat until well-toasted, normally 30-40 minutes. Cool on baking sheet. Add dried fruits when cooled. Stir in airtight containers for up to two weeks. Can also refrigerate or freeze for longer shelf life.